Traditional clinical consultations are usually a direct person-to-person interaction with a doctor or nurse in an outpatient setting. Advancing technology allows us to replace traditional follow-up appointments with telehealth services, whereby healthcare professionals can use electronic communication to remotely monitor patients and provide health information. While this is gaining momentum in some areas, it has not been widely introduced in oncology. 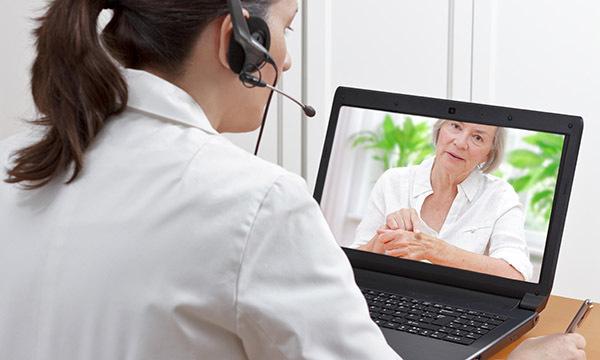 Two years ago, The Clatterbridge Cancer Centre piloted the substitution of telehealth consultations for the well-established, traditional nurse-led follow-up consultations. Although telehealth consultations have been used in primary healthcare, we couldn’t find evidence of it being used in oncology. We wanted to work out the acceptance and effectiveness of using video consulting technology in clinical settings. The patients who were selected to trial this method of follow-up were on long-term tyrosine kinase inhibitors for palliative treatment of a mutation-driven lung cancer. They were eligible for the trial when their disease was considered to be stable and had minimal toxicity. They were attending the hospital at least once every four weeks, and potentially more frequently depending on toxicity. Patients often had to travel more than 20 miles for their appointment, often relying on public or hospital transport. Patients who attended the nurse-led clinic completed a checklist to ensure they had appropriate IT equipment. Those able to participate were asked to replace two nurse-led appointments with a nurse-led telehealth appointment. A questionnaire was completed after each consultation by both patient and nurse to assess satisfaction. In the initial stages, there were some minor technical glitches, such as problems with the sound. However, I was able to solve this by phoning the patient while still seeing them on the screen. Problems with equipment were minimal. Patients reported a high level of satisfaction with this method of follow-up and said it was user friendly. Their hospital visits were reduced from one to two visits per month to just one every three months when they have a scan and a visit with the consultant. After the success of the telehealth nurse-led follow-ups, consultants are now investigating whether they can do similar consultations. The quality of patient care is on a par with the traditional method of follow-up, as patients are seen on screen, which means assessment of their colour, breathing and toxicities, such as any skin rashes, can still be carried out. The telehealth consultation can also act as a triage system and the nurses can call the patient in if they feel that a face-to-face assessment is required, or if any issues cannot be resolved remotely. While it hasn’t saved time for our nurses, it has led to there being more space in our nurse-led oncology clinics. It has been greatly beneficial to patients and even though the pilot has come to an end, we are continuing to use telehealth consultations with the same group of patients. The pilot scheme has demonstrated that telehealth does have a place in oncology management. The pilot was well received by the trust and it is keen to trial this with different patient groups and healthcare professionals. As oncology treatments continue to develop with the use of immunotherapy, patients can find themselves on treatment for longer periods and requiring more frequent hospital visits. Telehealth consultations have the potential to reduce the time spent in hospitals and can serve as an alternative to the traditional method of follow-up.